Clipping your cat's nails may be both of your least favorite activity, but it's essential that you routinely clip them to keep them healthy. Having the best cat nail clippers available can help smooth this entire process out, even if you've tried to clip your cat's nails for years with little success. However, finding these clippers can be very difficult because there are hundreds of brands, styles, and sizes available to pick between. Before we get to our top picks, we put together a buying guide will give you pointers to look for when you shop to ensure you get a great pair clippers and have success clipping your cat's nails. Why Clip Your Cat's Nails? You may think that your cat will wear their nails down on their own as they go about their day, right? 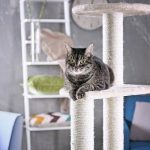 While this may be true for outdoor cats, indoor cats have difficulty wearing their nails down because there is a distinct lack of rough surfaces in your home. This means that your cat most likely won't be able to find a surface that is rough enough to help them remove the outer husks of their nails, and this is the main reason they scratch in the first place. Keeping your cat's nails clipped and trimmed every two weeks or so can help to keep your cat happy and healthy. Bad Alignment or Posture - Cats who have nails that are too long usually have pain when they walk. This pain causes them to alter how they walk around, and this can result in bad alignment, bad posture, or an uneven gait that puts stress on their joints. Bartonella henselae - Cats tend to walk in environments that aren't the cleanest or the healthiest, and these environments allow your cat to pick up bacteria or diseases. A scratch from a cat that has fleas can lead to an infection of Bartonella henselae. This is commonly called Cat Scratch Fever. Ingrown Nails - Your cat sheds the old nail to make room for the new nail, but indoor cats can have problems with this due to the lack of rough surfaces to scratch. If they're not able to get the nail off, it can result in an ingrown nail that is painful for them. Pain - Not only are long nails cumbersome for your cat, but they can also cause pain when they walk. Additionally, you have an increased risk of your cat accidentally scratching you if their claws are overgrown or very long. One of the first things you want to do is decide which type of cat nail clippers you want to buy. Clippers typically come in four broad categories, and the type of clipper you pick will depend on your and your cat's preferences. The electric grinder isn't a clipper per se, but it features a rough surface that spins at a fast rate and grinds down your cat's nails. Even though this type of clipper can create a very smooth and rounded edge on the nail, they're typically too loud for most cats to tolerate. The guillotine style nail clippers feature a small hole that you thread your cat's nail tip through between two blades. When you squeeze the handles, the blades come together and cut clean through your cat's nail. They're best for experienced cat parents, and they tend to dull quickly. These clippers look and act like a pair of pliers. They have longer handles that are very easy and comfortable to hold, and the blades are slightly shorter and more durable. They're great to use for cats who have thicker nails that tend to split when you cut them. The scissor style nail clippers come with shorter handles, shorter blades, and the blades are typically rounded with a notch for the claw to slide into. The design makes it relatively easy to clip your cat's nails, and they're immensely popular with beginners. Once you settle on a type, you can start comparing features in order to find the best clippers for your needs. You want something that will last, be durable, and make the entire process as easy on your cat as possible. Both the handle and the blades on your new clippers should be durable and built to last. Look for stainless steel blades that have firm attachment points to the handle because stainless steel is resistant to wear, rust, breaking, and corrosion. No matter what type of clippers you get, they should all be very easy to open, close, and cut with. You want to find clippers that have a design that fits into your hand, isn't too heavy, is lightweight, and that features a non-slip grip for you to hold. The blades on your clippers are sharp, and this means that they should come with some safety features built right into the design. Your clippers should have a safety lock that keeps the blades closed when you're done, guides to prevent you from cutting too deep, and a design that allows for accurate cuts. Your clippers should have some type of warranty attached to them. This warranty can last a month, a year, or it can be a full lifetime warranty that lets you return the clippers if they break or fail to work as they advertise. Make the process fun. Offer your cat treats and praise before, during, and after you clip them. This cat nail trimmer comes in three different sizes and six different options that allow you to customize your order to suit your cat's size and needs. The stainless steel blade is resistant to rust, wear, and tear, and breaking from extended use. The curved blade has a safety stop design that helps you trim your cat's nails without cutting too much off and hitting the quick. Additionally, the stainless steel design comes with a sharp edge that's designed to stay sharp for months at a time to prevent splitting the nail. The handles of these nail trimmers have a durable rubber coating that has room for your fingers to grip to help prevent slipping when you're trying to hold onto your cat. It also comes with a spring mechanism that makes it very easy to open and close these clippers for a quick cutting experience. Cat parents who bought these nail trimmers for their cat liked that the stainless steel blades came with sharpened edges that let them get precision cuts. Cat parents did say that even the smallest size clipper was slightly large and awkward to try and use. The semi-circular blades on these nail clippers by Epica give you a close and safe cut each time you use them on your cat. You can pick from two different sizes, and this lets you pick the size that is going to work best for your cat's nails. The blades are made out of top grade stainless steel, and this helps to ensure that the blades won't lose their sharp edges through repeated cuts. The blades lock closed when you're not using them, and this makes it both easy and safe to store them anywhere around your house. The handle comes with a durable rubber handle that keeps you comfortable when you use these clippers, and it also gives you something to grip onto. These nail trimmers come with a lifetime warranty, and you can return them at any point for a new pair or refund without a problem. People who bought these nail trimmers for their cat liked that they came with a safety latch that makes it easy to carry or store them. People who bought these for their cat did say that the handles tend to sway slightly when you apply pressure to them. These nail trimmers come in six different options including just the clippers, the clippers and a file, the clippers and a grinder, and a few different sizes. Specially designed for smaller animals like cats, these clippers have slightly wider finger holes to be comfortable to use. The clippers come with a month guarantee for your money back, and you also get a full year warranty on each pair of clippers you purchase. The rounded edge of the clipper's blades gives you an easy way to take the right amount off of your cat's nails without cutting the quick. The inside of the finger holes come with a durable but comfortable rubber padding that ensures you can use these clippers for an extended time without fatigue. The stainless steel blades are also easy to clean and maintain, and they're ready to go right out of the package. Cat owners who bought these clippers for their cats liked that it came with several different options and packages to pick between. Cat owners did mention that the handles do make these clippers slightly more difficult to operate if your cat moves around. Shiny Pet's cat nail clippers come with razor sharp blades that allow you to quickly and easily cut through your cat's nails. The blades come at an angle with curved edges that make it very easy to slip over the end of your cat's nails and clip them. The ergonomic handles come made of 100% recycled plastic, and they have wider holes for your fingers to go through that help ensure that you're comfortable when you use them. There are also textured ridges along the edges of the handles that help to prevent your fingers from slipping. The stainless steel blade comes with a hypoallergenic coating that ensures that they're able to withstand a lot of use and routine wear and tear without breaking, chipping, or rusting. The clippers also come backed by a 100% money-back guarantee that lasts for a lifetime. Cat parents who bought these clippers were very happy that they came with handles that were made out of completely recycled plastic. Cat parents did say that these clippers had a very small hole to try and get the tips of their cat's claws though to cut them. 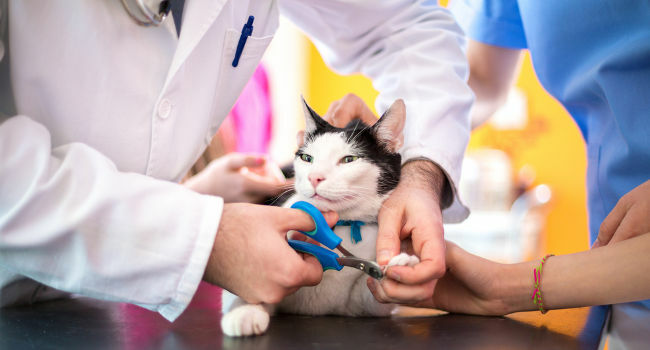 Gonicc's nail clippers feature a thick safety blade that is built right into the clippers that keeps you from cutting too much of your cat's nail and hitting the quick when you use them. The stainless steel blades are razor sharp and ready to go out of the box. There is a nail file built right into one of the handles that let you clip and file your cat's nails down to a safe, rounded edge very quickly and easily. There is a safety lock built into these clippers as well, and this makes it easy to carry or store them between uses. The tapered handles give you an ergonomic grip that is very comfortable to hold onto, even when you use them for extended periods of time. The handles also feature a non-slip rubber coating that helps you get a firm and secure grip when you clip your cat's nails. People who bought these clippers for their cats were happy that they got a lifetime warranty that allowed them to return the clippers if they didn't work out. They weren't happy that the nail guard tended to allow them to cut too much off of their cat's nails. What's the Best Cat Nail Clippers? Our pick for the best cat nail clippers are HDP Professional Stainless Steel Nail Trimmer because it gives cat owners several different choices and options when they order it. We also chose it because it has a nail safety stop built right into the clipper that helps prevent hitting the quick. The durable handles on these clippers provide something secure to hold onto when you use them, and it has a spring mechanism that makes these clippers easy to open and close. Finally, we liked that the blades are made out of a durable and sharp stainless steel for added durability.